David Cameron has had a "candid" exchange of views with German Chancellor Angela Merkel over who should get the EU's top job. The UK Prime Minister objects to Mrs Merkel's favoured candidate to be the next European Commission chief, former Luxembourg premier Jean-Claude Juncker. He is strongly opposed to Mr Juncker's belief in closer political union between EU member states. 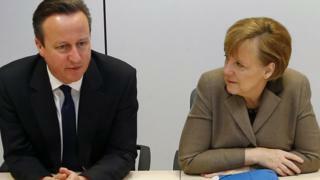 Mr Cameron met Mrs Merkel after a dinner for G7 leaders in Brussels. A spokesman for Mr Cameron said: "Their discussions focused on the next European Commission - the issues it should focus on and the appointment of the next president." Mr Cameron also spoke to Italian Prime Minister Matteo Renzi, EU President Herman Van Rompuy and outgoing European Commission chief Jose Manuel Barroso on the issue, his spokesman said. Describing the tone of the meeting with Mrs Merkel, a Downing Street source said: "They had friendly, candid and constructive discussions in keeping with how their bilaterals usually are and in the spirit of finding consensus." The BBC's political correspondent Ben Wright said "candid" was "diplomatic language for pretty robust". Mr Juncker was seen by Mr Cameron as "too Federalist, too old school and not the sort of person to deliver reform in Europe," he added, and it was causing a "real fault line between Britain and the rest of Europe, particularly Germany". EU leaders have traditionally named the Commission head on their own, but under new rules they now have to "take into account" the results of European parliamentary elections last month. Mr Juncker's European People's Party won the largest number of seats in May's polls. The centre-right grouping, which also includes German Chancellor Angela Merkel's Christian Democrats but which the Conservative Party left in 2010 to form its own, more Eurosceptic grouping, won 213 out of 751 seats in the Parliament. The EPP chose Mr Juncker as its candidate to succeed Mr Barroso but Mr Cameron and several other European leaders have voiced opposition to his appointment. Mr Cameron has been quoted as saying that the appointment could destabilise the UK government to the extent that it would have to bring forward a planned referendum on EU membership to 2016 from 2017. He was quizzed about why he was against Mr Juncker becoming the next Commission president at a joint press conference with US President Barack Obama at the G7 summit in Brussels. He told reporters: "It's important that we have people running the institutions of Europe who understand the need for change, the need for reform and I would argue that that is a view that is quietly widely shared among other heads of government and heads of state in the European Union." He added: "What I want to achieve is to secure Britain's place in a reformed European Union and I have a strategy for delivering that." Italian Prime Minister Matteo Renzi, said there was no clear backing for Mr Juncker among EU leaders but - in a possible dig at Mr Cameron - said no country could decide the issue unilaterally, adding: "This is not the time and place for diktats or vetoes." Speaking after talks with Mrs Merkel, France's Francois Hollande and Mr Cameron, the Italian PM said the first goal was to define the priorities for the next Commission and then decide on the right candidate to head the institution. "No candidate has obtained a majority and this is a very important step, therefore we must find a common understanding," he said.